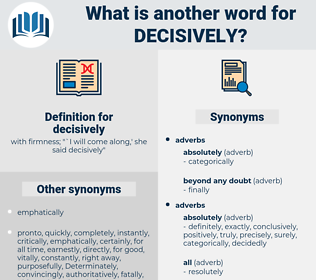 What is another word for decisively? with firmness; "` I will come along, ' she said decisively"
decidedly, firmly, vigorously, Definitively, definitely, conclusively, forcefully, crucially, emphatically, purposefully, categorically, aggressively, energetically, vehemently, convincingly, steadfastly, critically, certainly, boldly, robustly, significantly, absolutely, unequivocally, staunchly, roundly, radically, wholeheartedly, dramatically, clearly, flatly, considerably, rigorously, single-mindedly, squarely, utterly, strictly, substantially, vitally, effectively, surely, totally, fiercely, strenuously, drastically, persuasively, permanently, positively, completely, adamantly, actively, courageously, solidly, fundamentally, steadily, markedly, sharply, overwhelmingly, powerfully, meaningfully, unswervingly, heavily, enthusiastically, decisions, securely, immediately, ultimately, deeply, enormously, obviously. indefinite, doubtfully, uncertain, dubiously, partially, doubtful, incomplete, not sure, not certain, questionable, questionably. indefinitely, Changeably, weakly, Waveringly, Movably, flexibly.
" Then," said Carrie, decisively, " you are on no account to tell him about any business you may do for me - that is, unless I give you permission to do so." " No," said Brooke, a trifle too decisively. 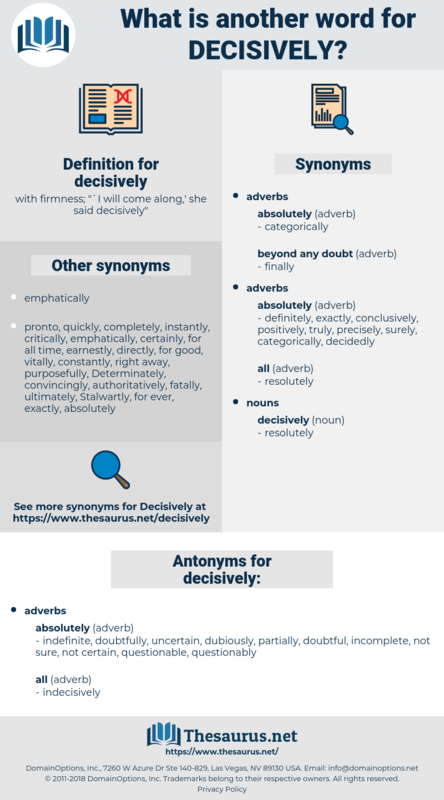 disciple, discocephali, dog flea, dog hobble, deducible, decayable, detachable, decibel, decouple, disavowal, disavowable, dishabille, duckbill, display, disk file, dispel, dishevel, despoil, deshabille, dishful, dissociable, disable, Dutch people.